Try these paddling trips to get on the water for a few hours or a full day. The Water Trail mile (WT Mile) is indicated below and corresponds to the NYS Canalway Water Trail Guidebook. Consult our tips for going through locks and safety information before heading out. Trips are listed west to east on the Erie Canal, followed by the Cayuga-Seneca, Champlain, and Oswego Canals. 6.6 0 round trip Paddle up the winding Buffalo River between towering grain elevators where Midwestern grain is stored. It was once transferred here from lake freighters to canal boats, but now goes by rail. River Fest Park and Mutual Riverfront Park are nice places to get out and stretch. There are several places to rent canoes and kayaks at Canalside and along the river or you can launch your own at Ohio Street. Ransom Creek Kayak Launch, Amherst (328.88) Nelson Goehle Public Marina Boat Launch, Lockport (319.50) 9.38 2 one way Descend the Niagara Escarpment without going over the falls. Pass through the "deep cut" and staircase Locks 34/35 of the Lockport Flight. A low dock at the top of Lock E35 provides an opportunity to get out, stretch your legs, and explore Lockport. Good ice cream and food options available near take out. Holley Canal Park (283.43) and return 9.16 0 round trip Paddle up to Holley for a picnic in the gazebo and let the canal's mild current help on your return. Corn Hill Landing and return 6.8 0 round trip Rent a canoe or kayak or launch your own at Genesee Waterways Center and follow the river through Genesee Valley Park, designed by the famous landscape architect Frederick Law Olmsted. You'll paddle past the University of Rochester campus and into the heart of downtown Rochester. The variety of riverscapes is striking along this short stretch. Just remember that you'll be paddling against the river's current on your return. Bushnell's Basin and return (250.63) 7.7 0 round trip Rent a canoe or kayak at Erie Canal Boat Company or launch your own at their ramp and paddle up to Bushnell's Basin. Enjoy ice cream, coffee, and several places to eat there before your return to Fairport. Above Lock E25, Mays Point, off NY 89, (203.11) Montezuma Heritage Park, Montezuma and return (200.82) 4.6 1 round trip Pull out on the shoreline just north of the Richmond Aqueduct. Explore the nature trails and historic canal sites within the park, including the remains of Clinton's Ditch Lock 62, a paper mill, drydock, bird lookout deck, and old Cayuga-Seneca Canal Canal Lock 11. Two murals are also located in the park. 9.4 0 one way Paddle a stretch of towpath-era canal, still watered but bypassed since 1918. Cross two stone aqueducts that carry to Erie Canal above Limestone and Chittenango creeks. Shorter options are available for exploring the Old Erie Canal. Ilion Marina (or Fulmer Creek Access, Mohawk, or Gems Along the Mohawk, Herkimer) (89.07) Little Falls Rotary Park (80.10) 9.97 1 one way Paddle a lovely combination of river- and land-cut canal sections. This stretch is generally free from road noise once you get past the New York State Thruway I-90 bridge east of Herkimer. Good places to stop for a break at Fort Herkimer Church and Lock E18. 6.2 0 round trip Rent a canoe or kayak at Little Falls Harbor or launch your own and paddle up to Lock E18 through a beautiful part of the Mohawk Valley. It is generally quiet here with the roads far from the river. At Lock 18 you can paddle for some distance up the Mohawk to get a sense of what the river looked like before it was canalized. Saint Johnsville Municipal Marina (69.48) 10.62 2 one way This trip provides the opportunity to pass through the highest lift on the canal system (Lock E17), stop at the home of Revolutionary War General Nicholas Herkimer, pass through Lock E16, and end at a place with warm showers. Port Jackson/South Side Launch, Amsterdam (38.50) 5.4 2 one way Take time to paddle up Schoharie Creek and explore Schoharie Aqueduct, then head down river through Locks E12 and E11, stopping to explore the old Yankee Hill Lock along the way. 8.5 0 round trip Rent a canoe or kayak at the Boat House or launch your own to explore a deep and largely unknown gorge of the Mohawk River. NOTE: You will be paddling upstream on your return. Leave extra time and energy. Aqueduct Park, Schenectady (17.33) Niskayuna Lions Park(11.20) 6.13 1 one way Paddle through a deep gorge on the Mohawk and explore Rexford Aqueduct, Enlarged Erie Lock 21; get out and explore the Vischer Ferry Nature and Historic Preserve. NOTE: This trip is best done in spring/early summer, before the water chestnut gets too dense to take out at Niskayuna Lions Park. Use Vischer Ferry Car Top Launch in August/September. Alcathy's Boat Ramp, Waterford (3.02) Waterford Point Boat Ramp (.28) 2.74 5 one way Take a fascinating trip through the Waterford flight of five locks. Enjoy varied paddling through rock cut sections, wide open basins with big views east to the Hudson River Valley, past the Waterford Canal Shops, and through the locks. Restrooms and amenities available at the end in Waterford. 4.4 1 one way This scenic paddling trip takes you on the Cayuga-Seneca canal, through one lock at Waterloo, and on to Seneca Falls. If you don't have your own boat you can rent one from Stivers Seneca Marine, Fuzzy Guppies, or Canalside Experiences, a short distance upstream of Oak Island Park. 10.51 1 one way This trip is a nice mix of river and land-cut paddling, passing through Lock C6 Fort Miller and ending at Lock C5 and Hudson Crossing Park. Alfred Z. Solomon Launch, Lock C5, Schuylerville (26.15) Stillwater Hudson Riverfront Park (17.21) 8.94 0 one way Enjoy a lovely float past Saratoga Battlefield with places to stop and stretch at Fort Hardy Park or the Schuyler Home in Schuylerville. .
9.99 4 one way This is the route of the annual Oswego River Paddlefest. Minetto is a nice place for a break. You can also start in Minetto at Riverview Memorial Park (18.16) and cut the total distance to 4.73 miles. Lock Island Park, Phoenix (2.33) Indian Point Landing, Fulton (12.90) 10.57 2 one way Here's a great opportunity to paddle through old Oswego Canal locks along the east shore, get out for a stretch at Great Bear Springs Recreation Area, and pass through two deep locks in Fulton. A take-out at the Stop 28 Ramp, upstream of Fulton, shortens the trip by 4 miles and 2 lockages. 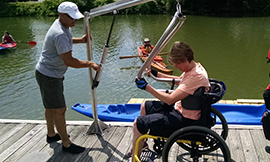 People with disabilities and their families and friends can paddle the canal at the Adaptive Paddling and Cycling Center in Fairport. Inquire about the free CanalPal program that sends a trained volunteer out to provide special training and support.